Find out how to bring your chatbot to life with a personality that fits your target audience. Discover tips that help your programmed responses charm customers into enjoying the chatbot experience. When creating a chatbot for your business, one of its most important features is its personality. Rather than annoy customers by providing a robotic experience, you can make the experience enjoyable. Its personality is an opportunity to meet the needs of your customers in a way that satisfies them and encourages online reviews. A chatbot is a robot, but it doesn’t need to sound like one. 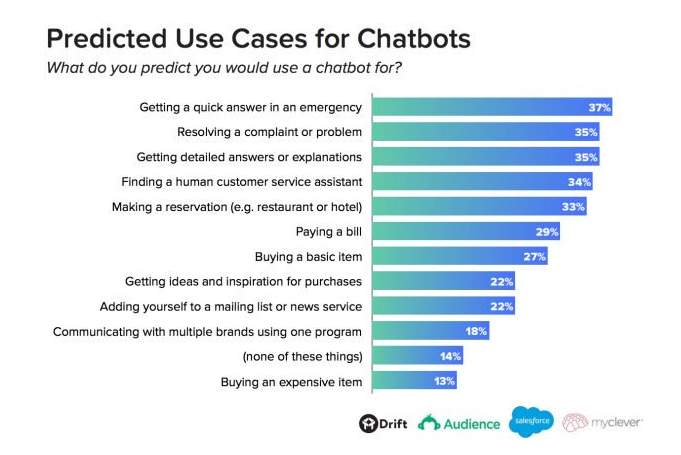 According to a 2018 Statista report, more than half of all people surveyed complained about the fact that chatbots prevent them from reaching a live person. Also, 47% of people claim that chatbot responses aren’t helpful. When programming your chatbot’s personality, these are important statistics to keep in mind. Will yours be smart enough to lead customers to a live person before they get frustrated? Instead of trying to pass off bots as real people, let customers know that they’re speaking to a machine. Your transparency from the start of the conversation helps alleviate consumer mistrust, so they’re more open to the idea of chatting with a bot. You can make this conversation both fun and informative. The welcome message should make it evident that the customer is chatting with a robot. For example, Social Voting app, Swelly, uses a chatbot on Facebook Messenger. Its greeting, “Hi [name]! 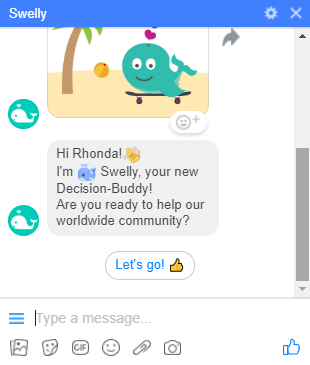 I’m Swelly, your new Decision-Buddy!” makes it clear that the customer is speaking to a robot. There are many ways to create chatbots that win over skeptical customers. In the following section, we’ll offer some options and tips to help you create a more human experience for your messaging system. Writers often mirror the personality of their audience by writing in the style they speak. Chatbots can do the same. For example, if the majority of your customers are 35–50-year-old female professionals, then don’t give your chatbot a teenage-like persona. Instead, get to know the personality of your audience very well. Learn about their life experiences, pop culture interests, and day-to-day language habits. Your chatbot will be less likely to irritate customers if its personality mirrors that of your customers. Understanding your buyer personas helps you decide how much friendliness, humor, and information you should provide from the start. An excellent example of this is the way the Wall Street Journal’s chatbot is programmed. The newspaper’s average reader is 49 years old and earns nearly $200,000 a year. Its overall readership includes 45% female and 55% male readers. 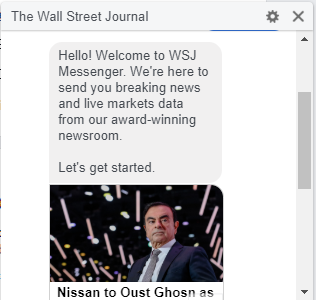 For this audience, WSJ approaches its chatbot greeting with a friendly “Hello!” before moving quickly into information and news choices. This is a great choice for the busy professionals that make up WSJ’s buyer persona. Your persona, however, might require more wit and less formality. 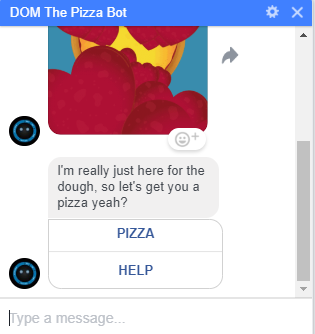 Domino’s DOM the Pizza bot greets customers with a bit of goofy humor in its “I’m just here for the dough, so let’s get you a pizza, yeah?” welcome message. Get to know your buyer persona intimately, and mirror their personality in your chatbot to create an experience that puts your users at ease. In addition to offering an honest, helpful conversation appropriate for your buyer persona, you can also add a bit of playfulness or friendliness into the discussion. Have you chosen a name for your chatbot? In some cases, it will be as simple as “WSJ Messenger.” If you prefer a more playful approach, consider giving your robot a name like DOM The Pizza Bot or Mr. Botty. Will yours be a man, woman, or gender-neutral bot? How old will he be, and where does he live (to narrow the style of communication)? What traits will its personality include? Consider your brand’s guide to style, and try not to veer far from your company’s personality. You can, however, amplify your style to make your bot more interesting. Don’t feel pressured to program humor or street-smarts for audiences that don’t crave those traits. A simple, helpful, and polite robot is the best choice for many brands. 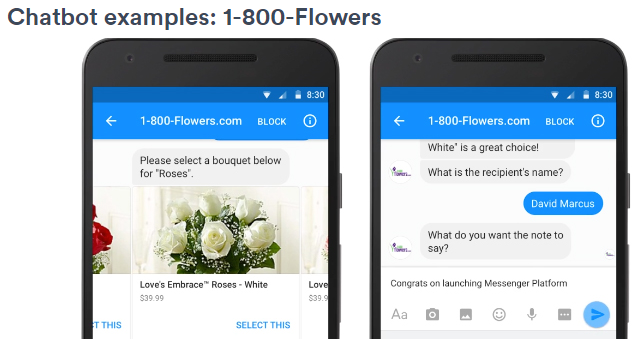 For example, 1–800-Flowers helps customers find their way to the right product and delivery rather than “chatting up” its customers. A bot may be best simply for its ability to get to a customer’s package-tracking information or easily start a product return. The personality that fits your audience may not include much “personality” at all. However, if your audience craves an entertaining customer experience, consider injecting playfulness or humor into your chatbot. Your chatbot will often need to answer questions unrelated to the information you intend to provide. Will you respond with the textual version of a blank stare, or will you use the opportunity to create a connection? Chatbots don’t have to be dry or dull. For example, Apple’s Siri is a programmed machine that people often think of as human. 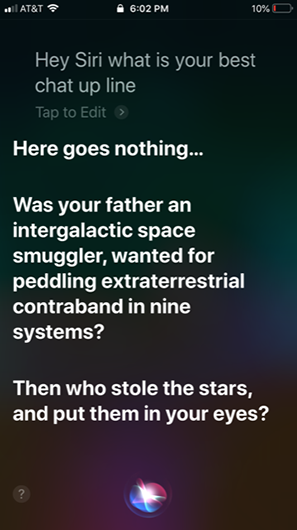 One of the reasons Siri is so well-loved is because of the way “she” responds to random questions. When users began receiving witty answers to silly questions, they were impressed to find Siri well-prepared. Siri’s charm put her in the national spotlight. Planned wit in response to unusual questions turned a pre-programmed message machine into one of the best-loved robots in the digital world. 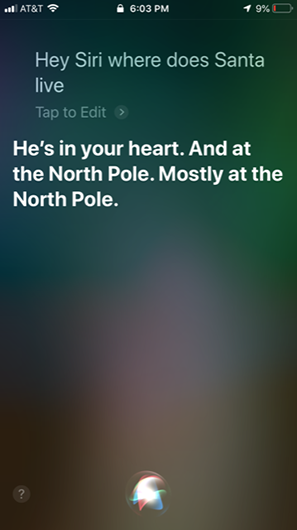 For example, when you ask Siri about Santa Claus or her best chat-up line, she’s quick to reply. Consider the exchange below about the location of Santa. Another example below showcases the sometimes nonsensical wit of Siri. Programming your bot to answer off-topic questions is one way to bring your chatbot to life. The surprise and laughter it inspires in customers are more than just a reaction — it’s a human connection. Your social media guidelines can steer the creation of Mr. or Ms. Chatbot in a way that charms your audience instead of chasing them away. This article was originally written by Rhonda Bradley and was published on The Manifest on December 11, 2018.